In Feudal Japan, the people of Edo are under siege by giant insects that ravage the land. The people desperately beg the government to do something about it. Thus the Insect Magistrate Office is established, gathering strong warriors to defend against the onset of pests. 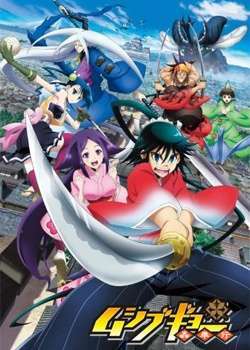 Mushibugyou follows Jinbee Tsukishima, a young man striving to be a master swordsman like his father. To atone for a horrific incident that occurred at his fault, Jinbee seeks to take his father's place as a member of the Insect Magistrate Office. On his journey there, he meets the lovely Haru, a young woman who helps manage her family’s tea house, and is forced to put his sword to good use in saving her from a grisly fate. This act of bravery that earns him a spot in the Insect Magistrate. Will this rookie exterminator be able to rid the land of the horde of insects swarming in?